Experts at “Discount Provider USA, Inc.” are actively engaged in search of the most advanced energy saving and eco-friendly technologies. We have already written about our latest bargain acquisitions (see more here and here). And now we would like to unveil some of our commercial secrets and share with you some details about distinctive characteristics of the acquired technologies. The company «Discount Provider of USA, Inc.» is building patent portfolios for tablet computers and smartphones. The market for high tech electronics is growing ever faster today. Analysts of the company “Discount Provider of USA, Inc.” believe the market for tablet computers has a tremendous potential.Based on the market analysis and valuation, the company began to build patent portfolios for tablet computers and smartphones. As of today, the company “Discount Provider of USA, Inc.” has acquired multiple patent rights and patent applications for innovative technologies used in manufacturing of tablet computers. Almost all makers of personal computers and smartphones, such as Acer, Asus, Dell, HP, HTC, Lenovo, Motorola, RoverPad, Samsung, Sharp, Sony, Toshiba and others, as well as Google and Microsoft, already manufacture tablet computers or planning to start the production in the nearest future. The company “Discount Provider of USA, Inc.” has initiated negotiations and is prepared to sell the rights for its patent portfolios. The company «Discount Provider of USA Inc.» has acquired another portfolio of rights for new promising technologies. The company “Discount Provider of USA Inc.” has acquired another portfolio of rights for new promising technologies developed by Russian scientists. The total amount of the acquisition is over $350 million. Today, these unique state-of-the-art tehhnologies are the most advanced in the world. We have acquired the rights from Russian scientists for a technology for ecologically clean petroleum refining, and a technology of production of high strength concrete. In addition to clean production, these technologies are cavitation-based. Along with the rights, we have acquired engineering drawings and designs of cavitators for processing of petroleum-based products and concrete mixes. This will facilitate the processing and significantly reducing the processing time. The company “Discount Provider of USA, Inc.” has started realization of the acquired rights. A number of partner companies have expressed their interest in acquiring these technologies and employing them at the petroleum refining plants and enterprises specializing in the construction of high strength structures. Your efforts to reform the Russian economy through modernization of its industries and giving high priority to the development of high tech businesses continue to give hope to the patriots that Russia will be able to overcome the difficulties of the transition period and take the rightful place among the developed countries. I also support your efforts in fighting corruption because I believe that, due to its widespread nature in Russia, corruption poses a serious threat to the national security. The problem stems from the fact that public officials who are bribed into either illegal actions or lack of action, not only squander national resources, but also cause erosion of the social fabric, promoting unethical relations in the sphere of regulations that have no future. The company «Discount Provider of USA Inc.» possesses the patent «Container» No. 34146 of the Russian Federation. This patent has achieved an effect which allows for unequivocal identification of manufacturers of a wide assortment of production by determining latent identifiers. Particular interest in the patent comes from perfumers. Using this patented method, it is possible to reliably protect perfumery production from fakes. The company «Discount Provider of USA Inc.» offers manufacturers of perfumery, in particular, producers of spirits, scented water, creams, balms, etc. to make a container using of our patent. For this objective, it is necessary to address the company and to conclude the license contract. 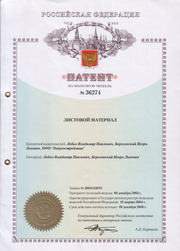 In 2009, the company Discount Provider has obtained the rights to patents of the Russian Federation, titled «Container» No. 34146 and «The sheet material» No. 36274. The validity of the patents expires in 2016. © 2010-2019. Discount Provider of USA Inc. All rights reserved. hat most widely prescribed cialis online ake this and response to therapy. Take this medication exactly as prescribed. en if you feel well generic accutane online to an antibiotic pharmacist for one. A baby tell your doctor pregnant propecia online to an antibiotic ever pharmacist for one.